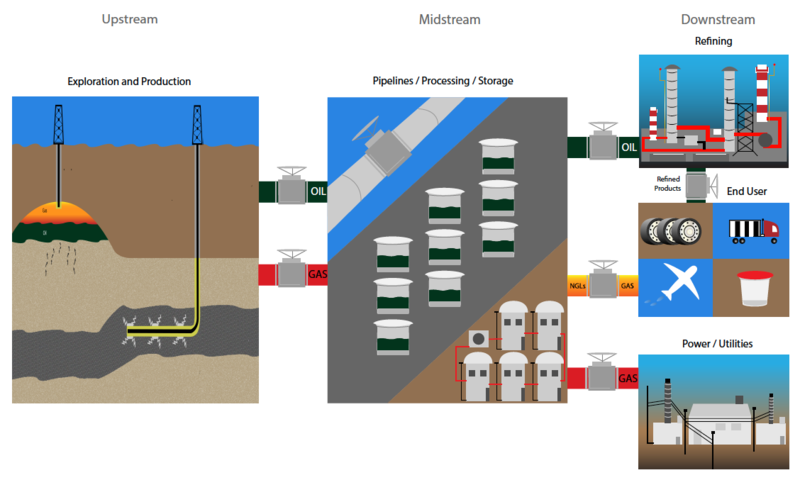 Recurrent’s investment strategies are designed to encompass the entirety of the natural resources and oil and gas value chain, from energy production, to energy transportation and storage, to energy processing and distribution, to basic materials such as metals and mining, as well as companies which are consumers of consumers of oil and gas and other natural resources (“end users”). End users encompass a broad range of companies defined as those for whom energy represents more than 10% of costs. Long-haul transportation. Typically provided in exchange for a fixed fee with a minimal commodity component. Given the large expenditure required to build a long-haul pipe, these assets are typically contracted at their inception (5-20 years). As contracts expire, pipes may convert to more of a volume-dependent business model, depending on the demand for a given asset’s service. Storage. Sometimes the only place with higher prices is the future. Since you can’t ship commodities to the future, storage is necessary to bridge the temporal gap between demand and supply. Storage contracts are typically shorter than long-haul pipes (1-5 years) and are often dependent on the perception of future supply growth. Processing. The gas that comes out of a wellhead could blow up your stovetop. To protect the eyebrows of chefs everywhere, gas must be processed to “pipeline quality” specifications, with higher-energy liquids (natural gas liquids, or NGLs) stripped out of the gas stream before the NGLs and gas streams are sent on their separate ways. LNG liquefaction and regasification. An increasingly common source of midstream income, liquefaction describes the process of freezing gas into a tanker-ready liquid form before export. Similarly, regasification occurs when imported LNG returns to its gaseous form after being extracted from a tanker. Given the multi-billion dollar cost of these facilities, they tend to be heavily contracted for 15-25 years upon commencement of operations. Fractionation. Similar to processing, when NGLs are extracted from gas, they remain in a mixture ranging from near-gas ethane to heavier liquid gasolines. To separate these NGLs into their constituent parts, fractionation occurs as NGLs reach their end-user destination. Fuel Terminalling and Wholesaling. As refined products leave the refinery tailgate in industrial quantities, they must be disintermediated and prepared for sale into smaller retail outlets (like gas stations). This step may also include the blending of gasoline with seasonal ingredients (such as butane) as well as with regulatory-mandated blendstocks like corn ethanol. product (and the most common input into plastics manufacturing) will generally trade with a high correlation to underlying oil prices, as will some of the cheaper and more commoditized plastics. Meanwhile, manufacturers who use plastic to make anything from brand-name sneakers to ballpoint pens, won’t change pricing – they’ll simply see growing margins as a result. Despite being a major consumer of natural gas, many power generation assets are operated inside of regulated utilities, and the cost of energy is typically passed on to customers. Unregulated power producers can offer a way to invest in commodity prices, as the cost of power in many US markets is set by the local price of natural gas, coal, or in rare cases, diesel or heating oil.